This document fixes a number of bugs idenfitied in the previous published draft as detailed in the change log. The Media Capture Task Force is working towards a Last Call for this document in the upcoming few weeks. This document is not complete. It is subject to major changes and, while early experimentations are encouraged, it is therefore not intended for implementation. The API is based on preliminary work done in the WHATWG. Applications are able to enable or disable a MediaStreamTrack to prevent it from rendering media from the source. A muted track will however, regardless of the enabled state, render silence and blackness. A disabled track is logically equivalent to a muted track, from a consumer point of view. 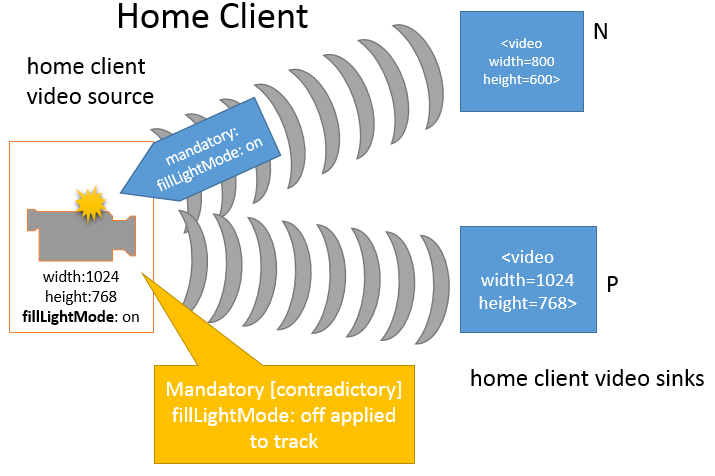 For a newly created MediaStreamTrack object, the following applies. The track is always enabled unless stated otherwise (for examlpe when cloned) and the muted state reflects the state of the source at the time the track is created. Let trackClone inherit this track's underlying source, kind, label and enabled attributes. Throughout this specification, the identifier CapabilityList is used to refer to the sequence<DOMString> type. 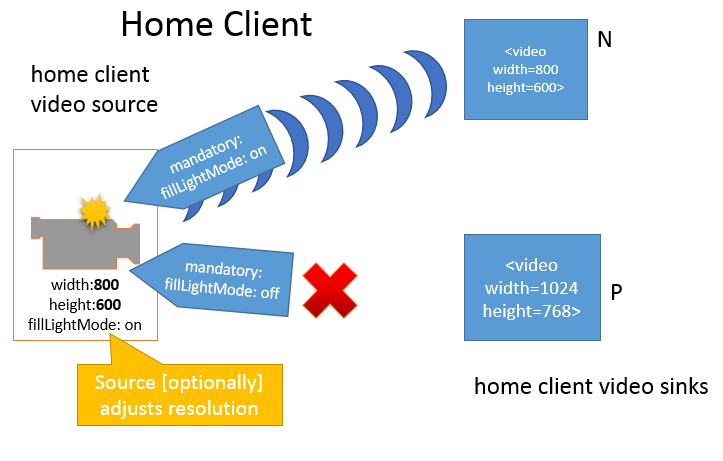 Whenever the user agent runs the media element load algorithm, reaches the resource fetch phase of this algorithm, and determines that the media resource in question is a MediaStream, it MUST immediately abort the resource selection algorithm, setting the media.readyState to HAVE_NOTHING if media is not yet available and to HAVE_ENOUGH_DATA once it is. currentSrc DOMString a local URI referencing a MediaStream or the empty string The UA automatically sets the value of this attribute. When srcObject is specified the UA MUST set it to the empty string. buffered TimeRanges buffered.length MUST return 0. A MediaStream cannot be preloaded. Therefore, the amount buffered is always an empty TimeRange. readyState unsigned short HAVE_NOTHING, HAVE_ENOUGH_DATA A MediaStream may be created before there is any data available, for example when a stream is received from a remote peer. The value of the readyState of the media element MUST be HAVE_NOTHING before the first media arrives and HAVE_ENOUGH_DATA once the first media has arrived. currentTime double Any positive integer. The initial value is 0 and the values increments linearly in real time whenever the stream is playing. The value is the current stream position, in seconds. On any attempt to set this attribute, the user agent must throw an InvalidStateError exception. If requestedMediaTypes is the empty set, let error be a new NavigatorUserMediaError object whose name attribute has the value NotSupportedError and jump to the step labeled Error Task below. If the constraint is not supported by the browser, jump to the step labeled Constraint Failure below. If the candidateSet no longer contains at least one track, jump to the step labeled Constraint Failure below. Otherwise, continue with the next mandatory constraint. Optionally, e.g., based on a previously-established user preference, for security reasons, or due to platform limitations, jump to the step labeled Permission Failure below. If the user denies permission, jump to the step labeled Constraint Failure below. If the user never responds, this algorithm stalls on this step. Permission Failure: Let error be a new NavigatorUserMediaError object whose name attribute has the value PermissionDeniedError and jump to the step labeled Error Task below. Constraint Failure: Let error be a new NavigatorUserMediaError object whose name attribute has the value ConstraintNotSatisfiedError and whose constraintName attribute is set to the name of the constraint that caused the error. Error Task: Queue a task to invoke errorCallback with error as its argument. This attribute is only used for some types of errors. For NavigatorUserMediaError with a name of ConstraintNotSatisfiedError, this attribute MUST be set to the name of the constraint that caused the error. Ask the DOM team to extend their list with the following errors. PermissionDeniedError: User denied permission for scripts from this origin to access the media device. ConstraintNotSatisfiedError: One of the mandatory constraints could not be satisfied. Bug 21967: Added paragraph on MediaStreamTrack enabled state and updated cloning algorithm. Bug 22210: Make getUserMedia() algorithm use all numbered items. Bug 22250: Fixed accidentally overridden error. Bug 22211: Added async error when no valid media type is requested. Bug 22216: Made NavigatorUserMediaError extend DOMError. Bug 22249: Throw on attempts to set currentTime on media elements playing MediaStream objects. Bug 22246: Made media.buffered have length 0. Bug 22692: Updated media element to use HAVE_NOTHING state before media arrives on the played MediaStream and HAVE_ENOUGH_DATA as soon as media arrives.